The core idea is quite simple (maybe simple enough to work), two jet aircrafts fly supersonic in a spiral in the perimeter of the cyclone with opposite rotation. The sudden pressure drop caused from the shockwaves will disrupt the momentum of the cyclone and stop its development. 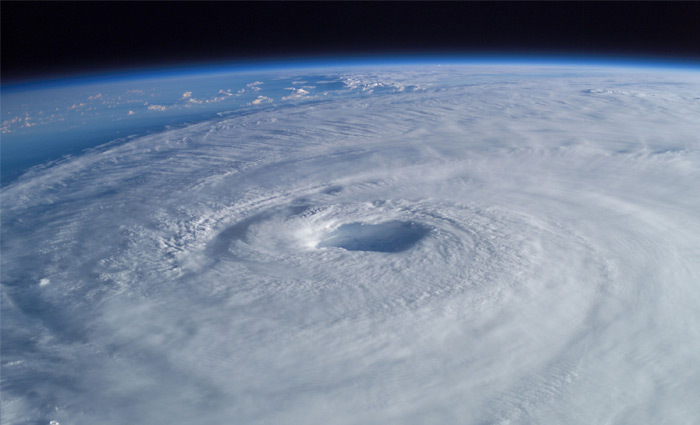 The idea is far fetched but its cost is non-significant if it can at least reduce the force of a hurricane. The aircrafts path may be very dangerous but remotely piloted aircrafts like QF-4 may be used. The first photo is from Hurricane Isabel from ISS (link), the second one is 3d visualization from the patent sketches and the last, sketches from patent files.